Photo of the Week: Reflecting on the Pittsburgh Skyline. While I was running out on the open Three Rivers Riverfront Trail in Pittsburgh I took the time to stop along the Allegheny River and reflect on the skyline. Photo of the Week: Pittsburgh in Autumn. Capture the Seasons in Photos. The Seasons. Spending a lot of my life in cooler climates, I’ve grown to appreciate what each distinct season has to offer. This is my entry in Booked.net‘s “Capture the Season” photo contest. Thank you to Erik of On My Feet or In My Mind for nominating me. I realize it is autumn/fall when I’m walking in a big city park and see the red, orange and yellow leaves on the trees like here at Point State Park in Pittsburgh, PA. The park is at the point where the Ohio, Allegheny and Monongahela rivers come together right in the heart of the city. I realize it is winter when I see snow on the ground and random sculptures of ice like here at Edgewater Park in Cleveland, Ohio. The ice is formed from the waves of Lake Erie crashing into the shoreline. You can see the downtown skyline in the background. I realize it is spring when I see lots of flowers and vegetable plants for sale like here at Eastern Market in Detroit. There is a yearly tradition in the Spring here of going to Flower Day, one of the biggest displays of flowers you’ll find anywhere. I realize it is summer when the sun is shining, it’s hot outside, everything is green and I find myself migrating to one of my favorite spots, Lake Lanier. The biggest lake in Georgia, northeast of Atlanta, is a popular summer holiday spot. Bonus Photo of the Week: The Allegheny River in Pittsburgh. Another pic to share this week is from along the Allegheny River and 16th Street Bridge on the North Shore trail on a chilly Autumn day in Pittsburgh. Captured during a run, on one of the Three Rivers Heritage Trails that follow along the rivers in Pittsburgh. Lots of photo taking capturing the Fall colors and everything along the riverfront. The 16th Street Bridge, an arch bridge, is one of the more popular in the city connecting North Shore with the well-known Strip District. Love the reflection of the bridge off the water. I’ve seen Pittsburgh from the road in the car, on foot from walking and running and from up in the hills. Pittsburgh is known for it’s three rivers, so it was time to see the city from the rivers themselves. The Gateway Clipper Fleet was going to help me accomplish this. Gateway Clipper Fleet is located in the historic Station Square on the south side of the Monongahela River. The ramp down to the fleet features murals representing Pittsburgh, throughout it’s history. Being a huge sports fan I focused on the murals of the Steelers, Penguins and Pirates all representing the city with championships and the colors black and gold. They have a fleet of five boats, are open year around and you have dozens of cruises to choose from. There are public ones for sightseeing, dining, dancing and day tips. Private ones for weddings, corporate and school events. These boats also serve as shuttles for sporting and special events. I’m taking the one hour city tour cruise on “The Duchess”. Very reasonably priced. Heading out on the Monongahela River toward the point you will pass by the two historic Wabash Bridge piers. They are all of whats left from the old railroad Wabash Bridge, demolished in 1948. Throughout the tour we were given bits of history and trivia from the crew. Right before reaching the point where the three rivers intersect you come up to the Fort Pitt Bridge which links the Fort Pitt tunnel with Point State Park. As you go onto the Allegheny River from the point you’ll be moving along the North Shore neighborhood and you’ll pass by PNC Park home to the Pittsburgh Pirates. On the other side of the river is downtown, in which you get a great view of the skyline when at the ballpark. As you go down the Allegheny River you’ll pass by the old Heinz 57 factory, the David L. Lawrence Convention Center, the Ft. Duquesne, 6th, 7th and 16th Street Bridges along with many more. You’ll come to the Fort Wayne (Pennsylvania) Railroad Bridge. It’s a double-deck bridge though the lower deck is not in use. The bridge was one of many in the region raised to increase navigation capabilities. This one in 1918. It’s easily seen by the lighter concrete that was placed on top of the original, darker stoned peers. Last but not least we went on to the Ohio River. You’ll pass by the North Shore neighborhood again and this time Heinz Field home to the NFL’s Pittsburgh Steelers and college football’s University of Pittsburgh Panthers. Great views of the surrounding hills can be had. Looking back towards the point you’ll get the best views of Point State Park and the city skyline behind. The Fountain at the head of the point is currently under construction and will reopen in 2012, just enhancing the scenic view. There are some great panoramic photo opportunities out on the water. It was a fast hour, definitely one of the highlights of my time in Pittsburgh. No matter the occasion/event or just looking to sightsee or looking for a scenic way to get to a sporting event, the Gateway Clipper Fleet definitely should be on the top of your list. 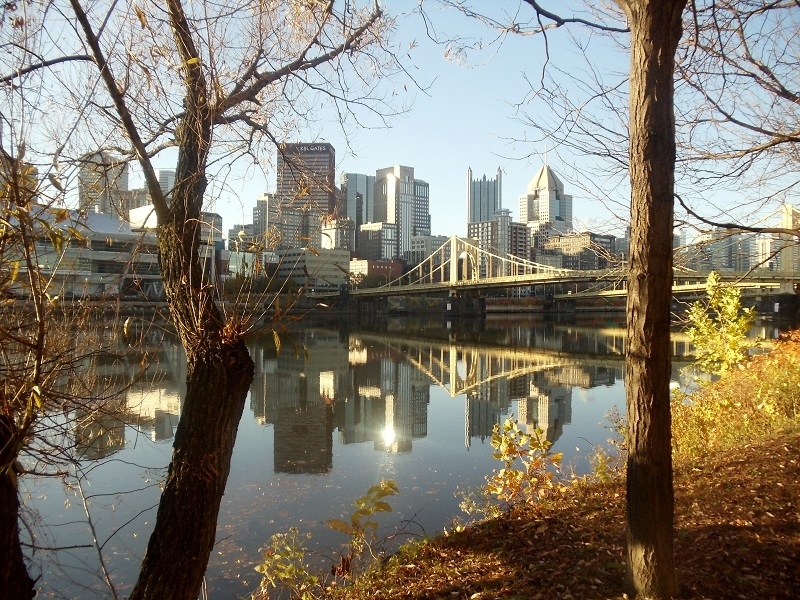 What’s your favorite thing to see along the rivers in Pittsburgh? What city or area is your favorite to cruise on the river to checkout the sites?